The Empire Turns Its Sights on Nicaragua – Again! It was only a matter of time before the US government and its compliant media would once again put Nicaragua in their sights. And, that time has indeed come. Last year, the US House of Representatives voted unanimously in favor of the Nicaraguan Investment Conditionality Act of 2017 (NICA Act) which would cut that already-poor country off from loans offered by international financial institutions. Currently, Nicaragua is the only country victimized by the US-backed Central American Wars which is not also a source of immigrants to the US. This is in no small part due to the Sandinistas’ effective social programs. As for the Sandinistas’ social programs, even the New York Times acknowledged that “[m]any poor people who receive housing and other government benefits support” Sandinista President, Daniel Ortega. Incredibly, as the US is preparing to build a wall ostensibly to keep out Central American and Mexican migrants, it is poised to exacerbate the very migration problem it claims to want to stop. This simply defies all logic and notions of morality and decency. As Noam Chomsky has opined numerous times, the US shall never forgive the Nicaraguan people for overthrowing the US-backed Somoza dictatorship in 1979, for militarily defeating the Contras and for then voting back in the Sandinistas in 2007. The NICA Act is pay-back for such crimes. But meanwhile, the NICA Act was getting no apparent movement in the US Senate and appeared to be a dead letter. 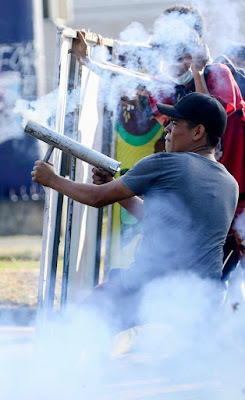 And so, right on cue, we witness violent protests in Nicaragua which closely resemble the violent guarimbas which have plagued Venezuela on and off since Nicolas Maduro was elected in 2013. These demonstrations will surely be used as a pretext to revive the NICA Act in the US Senate. There are a number of curious things about the protests in Nicaragua. First, while the mainstream press has explained these protests as a response to a “social security overhaul” announced by the government, it was largely students and other youth who have been demonstrating, and not those directly affected by the announced cuts. And, though the government reversed itself on the previously-announced social security cuts in response to the protests, the New York Times stated with glee that this probably would not stop the protests from continuing. Moreover, it must be pointed out that the proposed social security cuts which provided the impetus for the protests were themselves necessitated in no small part by the House passage of the NICA Act which, as Telesur noted, “has already put a chill on foreign direct investment into the Nicaraguan economy, having a knock-on effect on local lending activity and private investments.” Of course, this is all according to plan. the support of the Catholic Church and various NGOs for the anti-government activities. Not surprisingly, the Cold War-era National Endowment for Democracy (NED) has recently been giving substantial funding to groups in Nicaragua seemingly to stoke the very types of anti-government actions taking place right now. For example, the NED, in 2017, gave $72,440 to the Comision Permanente de Derechos Humanos de Nicaragua (CPDHN) for “human rights” monitoring. Curiously, the CPDHN is a key source the Western press has been relying upon for the lop-sided information about the current protests and the government’s response to them. 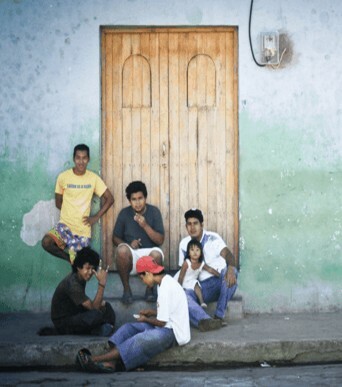 The NED has also been giving substantial monies to youth and student groups in Nicaragua – such groups now serving as the main source of the current unrest. In addition, the NED has given support to “independent” (i.e., anti-government) media outlets and to other civil society groups for the purpose of “raising awareness” about how the Nicaraguan government is allegedly repressing them. All told, the NED last year alone gave well over a $1 million in aid to civil society groups for the purpose of ginning up social strife in Nicaragua. During the 1980s, Nicaragua – a tiny country which remains the second poorest in the Hemisphere — inspired many of us, myself included, with its heroic resistance to violent US aggression. Nicaragua has remained a symbol of opposition to US imperialism, and that has galled the powers-that-be in this country – particularly Neo-Cons such as current National Security Adviser John Bolton. We must stand with Nicaragua now, as many of us did before, in opposing continued US hostilities in the form of the NICA Act and interference in Nicaragua’s internal affairs. Nicaragua deserves such solidarity. Daniel Kovalik lives in Pittsburgh and teaches International Human Rights Law at the University of Pittsburgh School of Law.